Let’s Go To Beeston – Again! Most Beestonian’s will recognise the logo for ‘Let’s Go to Beeston’ which was previously part of the Beeston BID campaign, and ran from 2010 – 2015. The management of the website is now being taken over by Beeston Community Resource (BCR) which manages Middle Street Resource Centre. The handover officially took place at the resource centre on October 5, and the Let’s Go to Beeston site and related social media are all in the very capable hands of a group of volunteers at Middle Street. LGTB used to receive funding but is now a charitable free service and is supported by Voluntary Action Beeston and Citizen’s Advice Bureau. Previously, the focus was very much on the centre of Beeston but now they are keen to involve the wider community, especially with the recently opened Canalside Heritage Centre in Beeston Rylands. The new partnership is ideal, and is providing not only the volunteers with something to put their skills to good use, but also to raise the profile of LGTB again and further benefit Beeston as a town and as a community. There are over 70+ volunteers at Middle Street, which began life as a Nottinghamshire County Council Day Centre for people affected by mental health issues. Today, the centre is still supportive of people with mental health issues, and a lot of the volunteers have experienced and still experience such issues as part of their everyday lives. By teaming up with Let’s Go to Beeston, it gives the volunteers the opportunity to put their skills into practice and give them something to work on which benefits them and the community of Beeston. As the management is mainly web and social media based, those with IT skills such as Karen will be able to contribute plenty to the online presence. Although the website is still a work in progress, there are already plenty of resources on there such as a community section, Beeston News and a business directory which needs the help of local people to keep it up to date as new businesses come into the town, and others leave. This community input is something that the team are keen to incorporate. 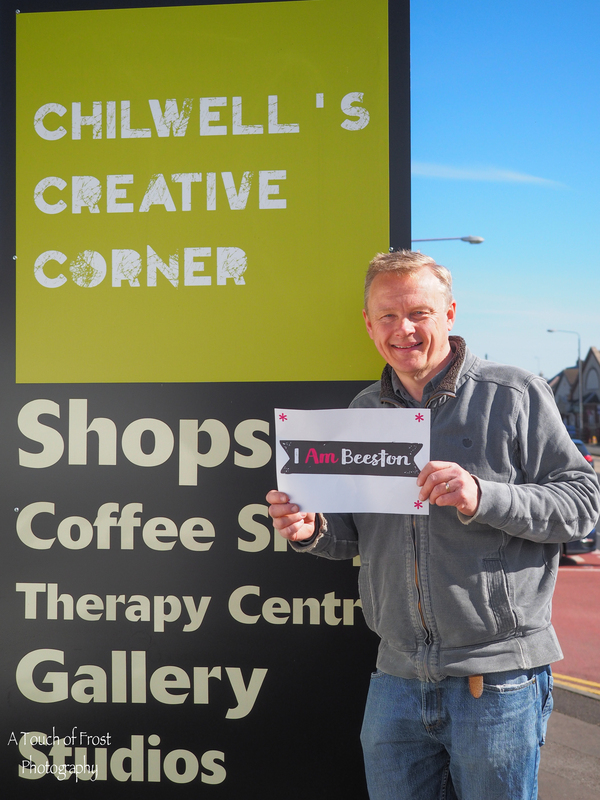 Colin calls for local photographers to send in their photos of Beeston to contribute to the website and celebrate Beeston in the most visual way possible. As well as this, he wants residents to let them know what your Beeston news is, and if you’ve got an event there will soon be a dedicated events calendar so people know what’s going on. There are also a few other developments arising from the re-launch of the website, which wants to take advantage of the 40,000 people who continued to engage with the site last year. The website and its ethos is ‘worth preserving’ and is a platform which can help in terms of submitting proposals for new things around the town, and is a good place to share points about what the community think Beeston could benefit from having or doing. They’ve got a newsletter which can be found at Middle Street, which is the place to go for anyone who wants to talk with the volunteers working on the site. The next two weeks will see the centre hosting various events for Mental Health Awareness Weeks, and they’ll have an open day next Monday from 2-7pm, which people are encouraged to attend and get involved with. All in all, the Let’s Go to Beeston website can only be a positive thing for the town and the volunteers working to make it the best it can be, and to provide an online space for residents of all ages and backgrounds to keep up to date with what’s happening. This article was a collectively written piece by ESOL students in Beeston, and is based on a real event. Some names have been changed. Huda would usually give Beeston ‘Ten out of ten: it’s a place I felt safe in and liked to call me home”. But a terrifying series of events changed that for a while. Huda came to Beeston four years ago. Originally from Egypt, she settled here when her husband got the chance to study for a PhD at the nearby university “It is a place I felt good about raising my children” she says “I love the community events, and always try and be part of what’s going on. It’s a town full of things to be involved with”. One morning, this was to change. She noticed an elderly man staring at her on the street. At first, she didn’t pay much attention to this: strange, but not that unusual. Yet when he appeared outside her house, and appear every time she was out, she started to get scared “It was not really a fear for me, but a fear for my children. I couldn’t understand why he was doing what he was doing, but he kept following me, kept standing outside my house. You don’t know if this person could have a gun or a knife, or if they could suddenly decide to do something drastic”. The worry got to her. While her husband was sympathetic, she found it hard to convey how the stalker made her feel. Plus, the intensity of working on his doctorate made Huda reluctant to keep mentioning it: he had enough stress with the workload. Yet the effects were getting stronger: she found herself placing a pushchair across the door at night to delay anyone breaking in. She changed the route she took to and from school, turning a five-minute journey into a forty-minute one. She struggled to sleep. “It sounds crazy. I taught karate in Egypt – I’m a black belt – and he was an old man. But fear makes you irrational”. Her love for her adopted town fell away “It was no longer ten out of ten. It was zero out of ten. I felt scared, lonely and isolated”. Huda found she was not alone in being stalked: other women had suffered the same thing in varying degrees. Talking to them made her feel less alone, and let her see that this could be dealt with. After two months, she visited the police to report the staling, but it proved fruitless. While they were generally sympathetic, as the man had not spoken to her, or tried to physically attack her, there was little that they could do. Bereft and scared, she mentioned her troubles to a member of staff at her SureStart centre. This got things moving. Huda found she was not alone in being stalked: other women had suffered the same thing in varying degrees. Talking to them made her feel less alone, and let her see that this could be dealt with. Her teacher at SureStart made some enquiries, eventually contacting the local PCSO, a friendly woman called Paula. Paula listened, and while she explained that the man was known to them, and mental health issues led him to act in such ways. While Paula assured her he was probably harmless, she still recognized the trauma he was subjecting Huda to. The PCSO could act as a community officer rather than a straightforward police officer, heading off trouble before it became a criminal issue. This is a vital and effective service, as proved by Paula’s intervention. She visited the stalker. Middle Street Resource Centre is an inconspicuous building. Long a feature of Beeston, its unassuming structure belies the vibrant creative activity within. The charity, Mindset, runs from here, lending support to those with mental health issues, and the socially excluded. It has been an invaluable asset for Beeston and surrounding areas, signposting and providing activities for those looking for them. The filmmaker Shane Meadows has run exclusive fundraisers at the centre, and it has gained plaudits from all quarters of the East Midlands, as well as from further afield. There are a multitude of courses here for people to participate in, from music appreciation to carpentry. A beautiful, meticulously-tended vegetable garden is a testament to the work done by the volunteers who have made it their own. We at Nottingham City of Literature are here for a less green-fingered reason, though: to meet an inspiring poetry group that has just put out their first anthology. The group-members gather, some clutching their own poetry, some with other’s work. They form a circle, and with no real prompt, start to share poetry. Tom has brought along four poems, each one exquisitely crafted tales of his life – of alcohol and breakdown. The group listen intently. They discuss the poems afterwards, opening up to each other and exploring the meaning behind the lines. It would be too simplistic to label this ‘talking therapy’; it is a spontaneous discussion, with any therapeutic aspect merely a helpful by-product. Ray, a young man with his poetry in pixel form, ready to be read off his tablet, tells me how the sessions have boosted his social confidence; first encouraging him to read aloud to the group, and then to the general public. It’s also an educational experience. In the previous week’s session, the chosen topic was the First World War. While the usual Sassoon and Wilfred Owen poetry was read, so too was that of the often-overlooked Irish war poets. Notable among these was Francis Ledwidge. Nick brings in lyrics that he judges are more poetry, with a particular love of Bob Dylan and Leonard Cohen. “So much can be poetry,” he tells the group. Earlier this year, Steve realised they’d produced enough good poetry to justify putting together a collection, and thus Journeys Through the Mind came to be. A diverse and fascinating volume, beautifully illustrated, they’ve sold most of their initial run of 100 copies and are considering printing more. For most of the contributors, it’s their first time in print. Poetry has proven to be a force for good with the group. They relish playing off each other, developing each other’s work, interacting and inspiring. Their weekly Monday meetings are looked forward to; they lend a crucial structure to the group and provide motivation for the participants. The group are now hoping to take their book on tour and perform in public places. If you know of a good venue, or a similar group to collaborate with, please get in touch with us via the Contact Us page. Street Art: Time to Act! Beeston Square’s old dark walls (down Station Road and adjacent to Beeston Centre’s tram interchange) badly need an aesthetic lift. We are planning a potential Street Art Festival for 2018 – a community regeneration project. Broxtowe Council have an ‘art budget’ set aside which is £8k (subject to committee approval). Artists are now invited to submit their work – the designs will ultimately be chosen by the council and its planning department but will be shown to the public who should have some say. Hello, good citizen of Beeston, how are you this lovely spring day? Very well, thank you – the sun is shining, the Crown has been refurbished and… hang on a minute, you don’t normally start your turgid ramblings with an individual greeting, what’s going on? Ah. Bother, you noticed. Weeeell… this column is a bit different. It tackles some… er… odd subject matter. I just thought I’d warn you. Don’t read it out loud, m’kay? Especially in the pub. As some of you may know, my lovely wife Sal is really quite poorly with a scary and incurable breast cancer which has spread to her bones, liver and brain. She’s coping with it reasonably well though, for the most part she’s in good spirits and we have our beautiful three year old daughter to keep us laughing which helps a lot. Moreover, thanks to the enormous generosity of a considerable number of very lovely people we recently had our garage converted into a downstairs bedroom for her as (just after we got married last September) Sal lost the use of her legs and partially because of this is unfortunately now quite often in considerable pain. I’d promised her and her best friend Lou a spa break before Sal’s diagnosis nearly two years ago as who wouldn’t enjoy a champagne filled weekend of pampering, relaxation and massage? Because of her condition though it appears almost impossible now as there don’t appear to be many hotel/spa resorts that will treat clients with advanced cancer (insurance issues I guess). So I thought I’d see if there was anyone locally who could help, not only for Sal and her pain but also for me as I do a lot of lifting these days and Sal keeps insisting, probably very sensibly, that I need to look after myself as well as her. So I went online and Googled ‘Beeston Massage’. Erm… look, I’m not hopelessly naïve, nor do I imagine Beeston is a haven of purity, decency and light (after all, our town topped the list of ‘Places People Have Extra-marital Affairs’ a couple of years ago) but one of the first links I found was to a site that reviews the… ahem… professional services of ‘Ladies of Transactional Affection’, so to speak. Very funny. Imagine a ‘TripAdvisor for Personal Services’ with a very in-depth and detailed review of the ‘goings on’ at the (now already closed) new massage parlour on Regent Street, as well as a many other locations. It was, to quote Star Trek’s Mr Spock, “Fascinating”. I read sections of the reviews out to Sal, her Mum and a group of friends when they were round and we were all laughing fit to burst (which was actually great therapy in itself). Maybe they’ll wait fifteen minutes and try again? You’re just being silly now. But as I said, maybe Beeston is packed full of naughtiness – or is demand drooping (sorry, dropping)? Was the closure due to local pressure, lack of demand or not paying the right business rates? Might it simply be that Beeston is no longer the illicit nookie capital of the UK, (and if not should we be pleased or disappointed)? No idea, I’m going to the pub for a stiff one. Oh suit yourself, I can tell you’re not taking this seriously. The really sad thing is Sal and I still haven’t found somewhere who can provide a nice, soothing and entirely respectable massage. Oh, that’s a real shame. I do so love a happy ending….